Ok, so I lied, but my free time was suddenly taken up. I also seem to be having one of those meh days...I blame the hay fever. Anyways moving on. So, I read some time ago Akagami no Shirayukihime by Akizuki Sorata. It is currently ongoing with about 8 volumes, most of which have been scanlated into English, so it is pretty up to date, which I figured was the best seeing as it was such a good series. 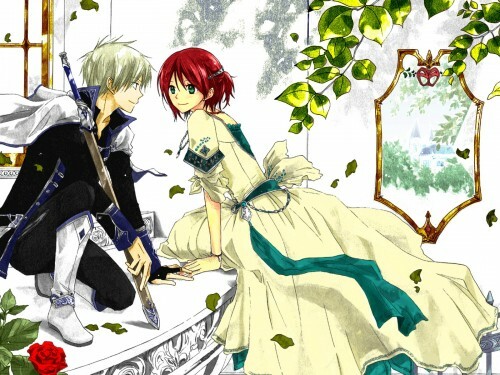 Shirayuki is a girl living in the mountains of Tanburn (varies somewhat depending on various translations) who is noticed by her country's prince, Prince Raji for her unusually coloured apple red hair. Unwilling to become a consort for the selfish Prince, Shirayuki escapes to a forrest in the neighbouring country of Clarines. In the forrest, she bumps into Zen, Mistsuhide and Kiki. After their enounter, Raji sends a poisoned apple to Shirayuki which is eaten by Zen. As a result, Shirayuki decides to permanently leave Tanburn and live in Clarines. It is only then revealed that Zen is actually the second Prince of Clarines. Once in Clarines, Shirayuki frequently visits the castle to meet with Zen and co, and one day goes out to find herbs. As a result of going out on her own she is kidnapped and held prisoner by a man who wishes to sell her for a high price. Zen eventually comes to the rescue, with the kidnapper escaping. After some time, Shirayuki decides she wishes to become a pharmacist due to her knowledge of herbs and basic medicine she learned in Tanburn. She studies and undertakes the test that would allow her to become a pharmacists' apprentice should she pass. During the test, it seems that Shirayuki is sabotaged by an unknown person because it is known that she has a strong friendship with Zen. This attempted sabotage results in Zen and Shirayuki being locked overnight in the herb house. It is because of the sabotage that Shirayuki realizes she mis-identified the plants. With the help of Zen, Shirayuki ammends her error and as a result passes her test. She becomes and apprentice phamracist for Ryuu, who is considered a genius as a pharmacist at the age of 12. As Shirayki begins her apprenticeship in the castle, Zen's older brother and First Prince of Clarines, Izana returns to the castle. Immediately he is informed of Shirayuki and becomes aware that in the futre, it could become an issue as she is of no status (meaning she is not a noble). Once Izana finds out that Shirayuki was once pursued by Raji of Tanburn, he invites the Prince to Clarines. Izana intends to get Raji to take Shirayuki back to Tanburn, but he declines, as he says he has no interest in her anymore. As he is about to leave, Raji and Shirayuki bump into each other. They settle their differences and can be seen as friends. After Raji has returned home, A Lord of an island and a resident come to the castle to settle a dispute about hunting the native birds. Although Zen and the rest know that the hunting of the local birds is wrong, they cannot stop it, as the Lord has jurisdiction over the area. Kiharu, the resident of the island, claims that the birds are trained in order for them to assist in the residents making their livlihood. Zen uses this information as a means to trial whether or not birds can be used as a form of communication.